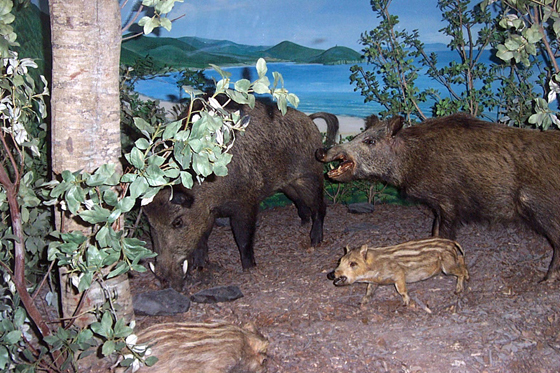 The wild boar (Sus scrofa) is the wild species that has engendered, through domestication and artificial selection, many races of domestic pigs and populations of pigs grown wild. The original area where it lives covers a large part of the Eurasian continent and the northern part of Africa. They are fairly solitary, they never form anything more than small groups with separated sexes. The males go close to the groups of females only in the mating season and follow fairly simplified rituals (simulated fights among males, short courtship). It is a nocturnal species and can move to long distances in a short time. It is a generalist species, generally a herbivore but occasionally a carnivore. They mainly eat bulbs, tubers, acorns as well as grass.